Go to the company’s main employment/careers website to access the official AlliedBarton job application (online version). Press the button/link at the top of this page to load the company’s careers site in your current window/tab. Scroll down this page (to the instructions section) to learn how to search for current openings, create an online account, and fill out/submit an application. 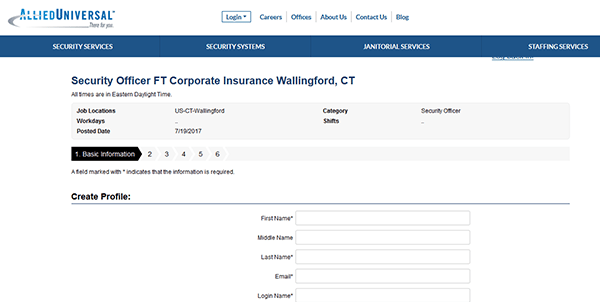 Corporate, security, janitorial, and IT positions can all be searched/applied for on the careers site. About the Company: AlliedBarton is a division/sub-brand of Allied Universal. Allied Universal is an American security services company based out of both Pennsylvania and California. The company was formed in 1957 and currently employs more than 160,000 people throughout North America. 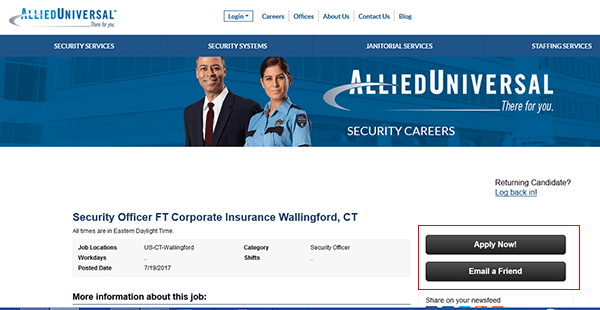 Step 1 – Click this link to load the AlliedBarton/Allied Universal careers page in a new browser window/tab.